***** Listed Finance prices are reduced based on a $3500 Down Payment plus taxes. Listed Finance Prices do not include Title fee, registration tag fees or Taxes. 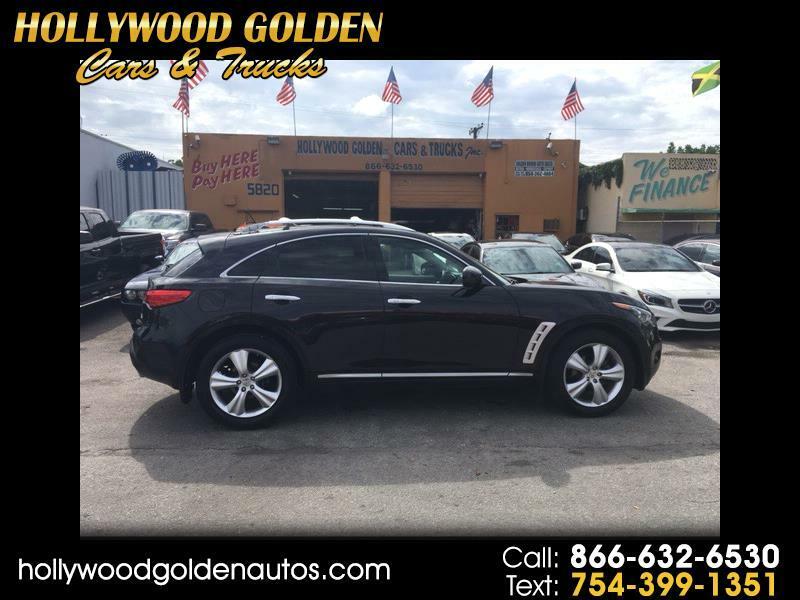 Price listed is Finance price after required down payment ***** Listed finance price is minus required down payment ******2014 Infiniti FX 35Â Full Power Backup Camera Navigation Parking Sensors Touchscreen Leather sunroof LOW LOW Miles !! Runs GREAT !!! All the Tech Loaded up Alloys Sunroof and much more!! Runs GREAT V-6 Motor Original Runs Like New !! ***** No Credit Check Financing HERE !!! Several to Choose From !! Runs GREAT !!! All the Tech Loaded up Alloys + more runs great ****-*- FREE WARRANTY ***** LOW Miles . ! !Â ***** Listed Finance prices are reduced based on $ 3500 Down Payment plus taxes. ********** Listed Finance Prices do not include Title fee registration tag fees or Taxes. ********* Several other vehicle to choose from starting at $ 1500 down and up *****In great condition everything works perfect !! All Vehicles Come with a WARRANTY ! **** On Sale here at Hollywood Golden Cars and Trucks**** Any questions on this ONE Call me Direct at 954-362-4684 All Vehicles are guaranteed. -Â -- Nice n Clean inside and out Runs GREAT !! For more pictues and information on this and all of our other vehicles check out all of our inventory online @ hollywoodgoldenautos.com********* BUY HERE PAY HERE *****No Credit Check************** Hollywood Golden Cars and Trucks ************Check out all our inventory online hollywoodgoldenautos.comÂ 954-362-4684 Se Habla EspanolÂ We accept VISA M/C and ATM DEBIT CardsÂ ** WE OFFER NO CREDIT CHECK FINANCING CALL US AT 866-632-6530 **EVERYBODY drives. Every body approved with Required Down Payment !! !Â WE MAKE IT EASY!!! NO CREDIT CHECKS!NO PROOF OF INCOME!! NO SS NEEDEDSe ofrece FINANCIAMENTO SIN CHEQUEO DE CREDITO **Â NO NECESSITA NUMERO DE SOCIAL PARA FINANCIAL AQUI **Â Todos Manejan sin chequeo de credito** Trabajamos con nuestros clientes** Lo Hacemos facil de manejar ** LOS FINANCIAMOS AQUI !! ****** Visit us online at www.hollywoodgoldenautos.com to see more pictures of this vehicle To schedule your test drive. Call me at 954-362-4684 office ********** ********************************************************** **************** Hollywood Golden Cars and Trucks ********************* *********************************************************** 5820-A Funston Street Hollywood FL 33023 Check out all our inventory online *** www.hollywoodgoldenautos.com ****** 1-866-632-6530 Se Habla Espanol *** We accept VISA M/C and ATM DEBIT Cards *** ** WE OFFER NO CREDIT CHECK FINANCING CALL US AT 866-632-6530 ** *** Call us today at 1-866-632-6530 for any information needed on any of our vehicles listed for sale. Call or stop by and see it at 5820-A Funston Street in Hollywood FL 33023 *** WE MAKE IT EASY! !EVERYONE APPROVED WITH REQUIRED DOWN PAYMENT! NO CREDIT CHECKS! *** NO PROOF OF INCOME!! NO SS NEEDED *** Se ofrece FINANCIAMENTO SIN CHEQUEO DE CREDITO ** NO NECESSITA NUMERO DE SOCIAL PARA FINANCIAL AQUI ** Todos Manejan con deposito de entrada requirido ** Trabajamos con nuestros clientes ** Lo Hacemos facil de manejar ** LOS FINANCIAMOS AQUI ! !Â ***** Listed Finance Prices do not include Title fee registration tag fees or Taxes. ********* Several other vehicleS to choose from starting at $ 1500 down and up *****In great condition everything works perfect !! All Vehicles Come with a WARRANTY ! **** On Sale here at Hollywood Golden Cars and Trucks**** Any questions on this ONE Call me Direct at 954-362-4684 All Vehicles are guaranteed. -Â -- Nice n Clean inside and out Runs GREAT ! !Â *****Â For more pictures and information on this and all of our other vehicles check out all of our inventory online @Â Â Â *************Â Â Â hollywoodgoldenautos.comÂ Â ********************** BUY HERE PAY HERE ***** No Credit Check ******************* Hollywood Golden Cars and Trucks ************Check out all our inventory online hollywoodgoldenautos.comÂ 954-362-4684 Se Habla EspanolÂ We accept VISA M/C and ATM DEBIT CardsÂ ** WE OFFER NO CREDIT CHECK FINANCING CALL US AT 866-632-6530 **EVERYBODY drives. Every body approved with Required Down Payment !! !Â WE MAKE IT EASY!!! NO CREDIT CHECKS!NO PROOF OF INCOME!! NO SS NEEDEDSe ofrece FINANCIAMENTO SIN CHEQUEO DE CREDITO **Â NO NECESSITA NUMERO DE SOCIAL PARA FINANCIAL AQUI **Â Todos Manejan sin chequeo de credito** Trabajamos con nuestros clientes** Lo Hacemos facil de manejar ** LOS FINANCIAMOS AQUI !! ****** Visit us online at www.hollywoodgoldenautos.com to see more pictures of this vehicle To schedule your test drive.Â Call me at 954-362-4684 office **********Â Â Â *********** **************** Hollywood Golden Cars and Trucks *********************Â Â Â Â Â Â Â Â Â Â Â Â Â Â Â Â Â Â Â Â Â Â Â Â Â Â Â 5820-A Funston Street Hollywood FL 33023Â Check out all our inventory online *** www.hollywoodgoldenautos.com ****** 1-866-632-6530 Se Habla Espanol *** We accept VISA M/C and ATM DEBIT Cards *** ** WE OFFER NO CREDIT CHECK FINANCING CALL US AT 866-632-6530 ** *** Call us today at 1-866-632-6530 for any information needed on any of our vehicles listed for sale. Call or stop by and see it at 5820-A Funston Street in Hollywood FL 33023 *** WE MAKE IT EASY! !EVERYONE APPROVED WITH REQUIRED DOWN PAYMENT! NO CREDIT CHECKS! *** NO PROOF OF INCOME!! NO SS NEEDED *** Se ofrece FINANCIAMENTO SIN CHEQUEO DE CREDITO ** NO NECESSITA NUMERO DE SOCIAL PARA FINANCIAL AQUI ** Todos Manejan con deposito de entrada requirido ** Trabajamos con nuestros clientes ** Lo Hacemos facil de manejar ** LOS FINANCIAMOS AQUI ! !